Central air conditioning systems are the units of choice in North Carolina for both homes and offices. Central Air has become increasingly popular in the past thirty years because these units help to keep the entire home or work place a comfortable temperature. Central Air is an updated cooling system that works better than a window unit. Berico, Carolina Fuels and Alamance Oil has been helping their customers with the installation and repair of Central Air Conditioning units for decades. Call Berico, Carolina Fuels or Alamance Oil today with any questions about Central AC or to schedule an installation or repair appointment. One of the main reasons of this rise in popularity, is that central air helps to keep the entire home or office at a controlled climate so the temperature is comfortable for everyone. A window unit air conditioner, however, is usually only capable of keeping one particular area cool while wasting more energy in the process. Central air is simply an updated cooling system that works better than a window unit. So how exactly do these systems work? 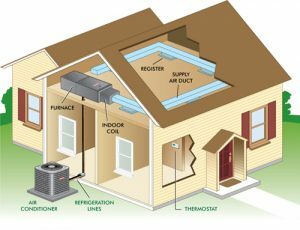 A central air unit is typically installed outside of the home, usually in the backyard or alongside of the home or office. It will operate from the outside of the home or office, while controlling the temperature inside of the building to ensure that it is comfortable for everyone. The problem with window unit air conditioners is that it tends to get a bit too cold in one room while the other rooms are actually still hot, causing many issues including a high energy bill. The central air unit keeps each room comfortable instead of just one room being comfortable and cuts down on energy costs. Berico, Carolina Fuels and Alamance Oil have been helping their customers with the installation of Central AC units for quite some time now. We hire only the best of the best when it comes to technicians who work to help customers with all of their cooling and heating needs. If reliability is something customers are interested in, Berico can offer that and then some. The technicians here perform a wide variety of services for each of our clients. We are able to install the central air unit without a hassle. We also offer many brands such as York, Lennox and Goodman to choose from. Aside from installing these systems, we will also keep up with the maintenance of the unit. Maintaining the system is just as important as the actual installation because it helps to keep debris and dust out of the filters, which would block the comforting cool air from making its way through the building. Maintenance also helps to keep things clean and efficiently working. If there are every any issues with the actual functioning of the unit, the technicians here will be able to come out at any time, any day of the week to help with repairs. This means that you never have to go without a comfortable, cool temperature for long if any problems arose. Central air units are ideal to have in homes and commercial properties. If you are are in need of central air conditioning installation or repair, please contact Berico by calling or visiting our Contact Page. We believe that you should never have to wait for comfort which is why we are available 24 hours a day and 7 days a week.